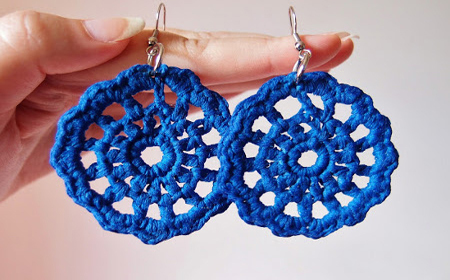 When there is little left in the recycled fabric coil we always have the feel that we can make a little art work, and that is true, because we can always make earrings or rings, as there are many models that can be made easily and others that surely we can create with our imagination. This entry was posted in Jewelry and Accesories and tagged accessories, ideas, jewelry, recycled fabric, t-shirt yarn on October 30, 2013 by Sue. 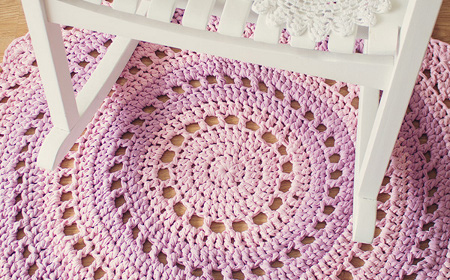 Today we are going to show you a crochet rug “mandala” that is not hard to do and looks beautiful. 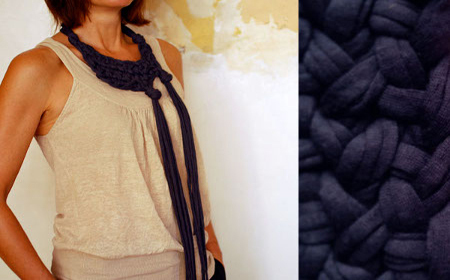 This is a pattern that you can follow with these detailed directions: ring, chain, slip stitch and double crochet. This entry was posted in Rugs and tagged crochet, how to, rugs, t-shirt yarn rug, tutorial on October 29, 2013 by Sue. 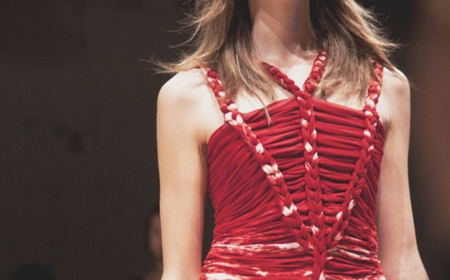 In some fashion magazines you can find this relaxed and elegant style called “hippie chic“, which is a design style inspired somewhere between the aesthetics imposed by Janis Joplin and Christian Dior respectively. This entry was posted in Jewelry and Accesories and tagged accessories, how to, jewelry, necklace, t-shirt yarn on October 27, 2013 by Sue. I love these rustic patchwork rugs, maybe because they bring to my mind the patchwork blankets, that are so warm and made with so much love because they carry a great time of manufacture. 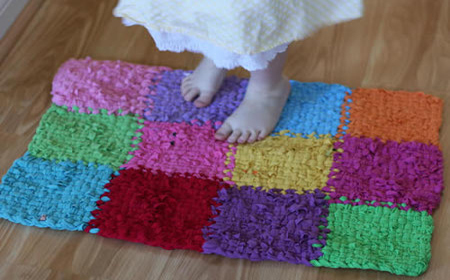 These patchwork rugs are a creation of petitepurls who share the step by step to make them using a loom. This entry was posted in Rugs and tagged how to make rugs, loom, rugs, rustic rugs, t-shirt yarn, tutorial on October 11, 2013 by Sue. This entry was posted in Decorate with fabric and tagged decorate with fabric, ideas, recycled fabric, t-shirt yarn, t-shirt yarn ornaments on October 9, 2013 by Sue. 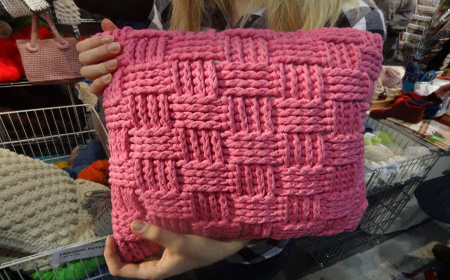 I would like to make an easy T-shirt yarn bag, but maybe an experienced weaver would say “but all T-shirt yarn bags are easy to make”. 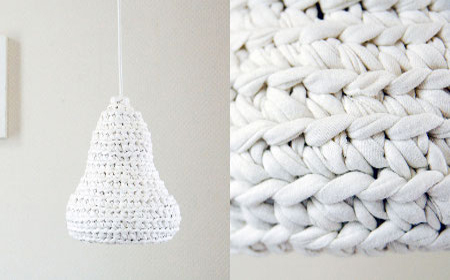 Well, not for us, the apprentices that are starting in crochet with and XXL needle. 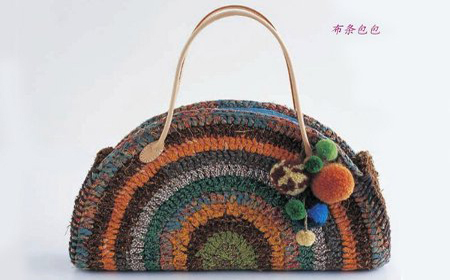 This entry was posted in Handbags and tagged handbags, handbags schemes, how to make, t-shirt yarn, tutorials on October 8, 2013 by Sue. 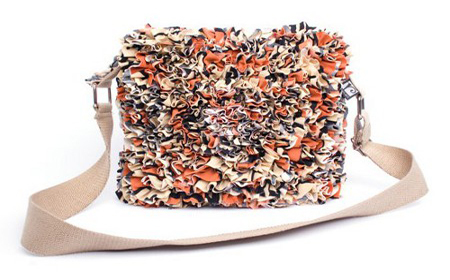 This entry was posted in Handbags and tagged bags, handbags, ideas, models, t-shirt yarn on October 7, 2013 by Sue.